Huge Savings Item! Save 14% on the Language, Sexuality, and Power: Studies in Intersectional Sociolinguistics (Studies in Language Gender and Sexuality) by Oxford University Press at Translate This Website. Hurry! Limited time offer. Offer valid only while supplies last. Language, Sexuality, and Power: Studies in Intersectional Sociolinguistics examines the diversity of sexuality as a social and linguistic phenomenon. 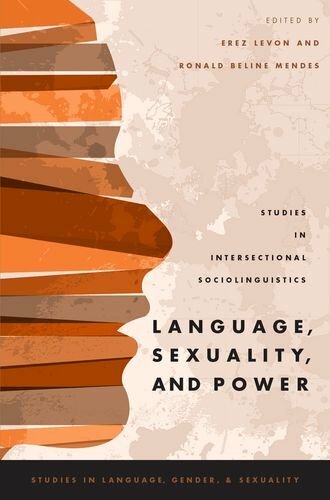 Language, Sexuality, and Power: Studies in Intersectional Sociolinguistics examines the diversity of sexuality as a social and linguistic phenomenon. Bringing together work on Africa, Asia, Europe, Latin America, North America and the Middle East, the volume explores how different ideologies of what it means to belong to a nation or culture influence how sexualities are both understood and linguistically expressed in a range of global locales. Contributions to the volume use experiments, discourse analysis and different types of statistical tests to identify the particular aspects of language - accent, grammar, vocabulary, discourse - that are ideologically associated with sexuality in specific contexts. Combining insights from linguistics, anthropology, sociology and cultural studies, the essays describe how individuals draw on these culturally-specific associations both when evaluating the speech of others and in their everyday presentations of self. Together, the eleven chapters in the collection provide a wide-ranging and multi-method perspective on how language mediates individual desires and larger social structures. They also serve to demonstrate the diverse interconnections between sexuality and other dimensions of lived experience in a variety of previously under-explored national and linguistic settings.